A refund anticipation loan or a tax refund loan is like a cash advance on your income tax return. You will receive your refund in one or two days instead of waiting for the return to be sent to you by mail or direct deposit. The business that offers you the loan will then take your refund to pay off the loan. If there were any mistakes in your taxes, then you will have to pay the difference if you end up receiving a lower return amount. Additionally you will have to processing fees if you apply and are not approved for the loan. A tax refund loan is on the of the things you should not spend your refund on. Where Do You Get a Refund Anticipation Loan? A refund anticipation loan is offered through the major tax preparation businesses. These loans give you your refund in just one or two days, but the quick return of your cash comes with a hefty price tag. You should carefully consider all of your options before taking out a loan on your refund. If you need money quickly, you may want to consider other options that have lower fees attached to them. You may be able to work with creditors if you tell them you can pay in a few days. If you are just excited to have the money to spend on new things, then it makes sense to wait in order to receive your entire refund. 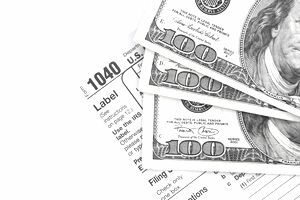 You may consider using an accountant or tax software instead of going to a tax preparation business. Is This Different from an Instant Refund Offer? Many consumers do not realize that the instant refund programs are actually loans. The fees associated with these loans put the interest rates as starting at forty percent, with many of the rates going well over one hundred percent.. Most people would not borrow money at an interest rate that high. These loans are often pushed more frequently to lower income people. These loans have similar fees and interest rates to payday loans, and they should be avoided if at all possible. When these loans were first offered it could take much longer to receive your refund because everything was processed through the mail, but that is not the case any longer. Additionally with the option of using e-file and direct deposit, you virtual eliminate your waiting time. The refund anticipation loans can take up to ten days to receive, which is about the same amount of time it will take to receive your refund anyway. Many consumers do not realize how short the waiting time really is. The earlier you file during the year, generally the more quickly you will receive your refund. If you do not make much money, you may qualify to use free file. This program allows you to file your taxes online using tax software, but there is no charge. You do not need to pay for an accountant since the program will take you through the entire process. Many states also have a free file option that can help you save. Some states will offer a free file version too. If you are self-employed, you may end up paying more to file your taxes online, but you will still pay less than if you went to an accountant. If you have enough extra money, so that you do not worry about throwing away the three hundred dollars in fees and interest, then you likely can wait for the money as well. If you are strapped for cash, you may be better off paying a few things late, since the late fees may end up being less than the loan application fees and interest. Additionally paying for something on a credit card and paying it off is less expensive than what you would pay with this type of loan. No matter how you get your refund back you need to create a spending plan for your refund, so that you can reach your financial goals and you do not waste the money you receive back each year. If you receive a large refund, you have the option of changing your withholdings and receiving the money throughout the year. However, if your tax situation changes, you will need to make changes so that you do not end up owing taxes at the end of the year.